From a farming background, married a farmers daughter, Audrey (Hence the A & A)! & established A & A Animal hotel in August 1993. 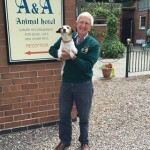 They both have many years experience of caring for animals and it was an ambition for a long time to open an animal hotel, where people can feel at home leaving their much loved pets in our care. Having grown up with animals all my life, it was of no surprise that I wanted to work with animals in the future. Working with horses upon first leaving school, until I was able to get a position at our local vets to train and be a veterinary nurse. 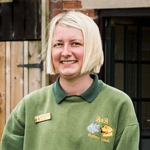 Marrying a farmer, Andrew, started a family, Georgina and Emma andI then started to work at home in the animal hotel. Being made a Partner in August 2002. 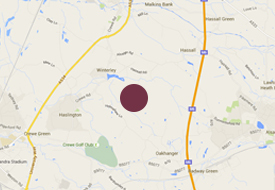 With both families living on site, we can make sure guests are safe and secure at all times. I've worked at A & A Animal hotel for twelve plus years. 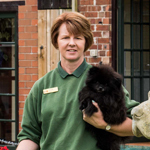 I attended Reaseheath College where I achieved an NVQ Level 3 in Animal Care. I also completed a grooming course, where I gained 3 credits. I have competed at dog agility with my little terrier cross, Molly, reaching Grade 5. In my spare time I enjoy entertaining my little girl, Lois and spending time with my family and friends. I attended Resaeheath College where I studied and achieved Animal Management Level 3 Subsidiary Diploma. In my spare time I enjoy days out and seeing my friends. 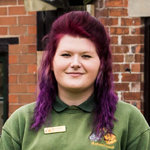 I have worked at A & A Animal hotel for two years now. 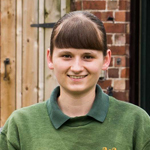 I first came to A & A to complete my work experience, as I was studying my top-up course to my Level 3 Subsidiary Diploma at Reaseheath College. Working at A & A has also allowed me to apply my dog grooming skills and also completing a dog first aid course has helped me improve my skills. I have several pets of my own including a dog, cats, budgies and fish. In my spare time I love going on days out with my family, reading, gaming and I also have a passion for cars.